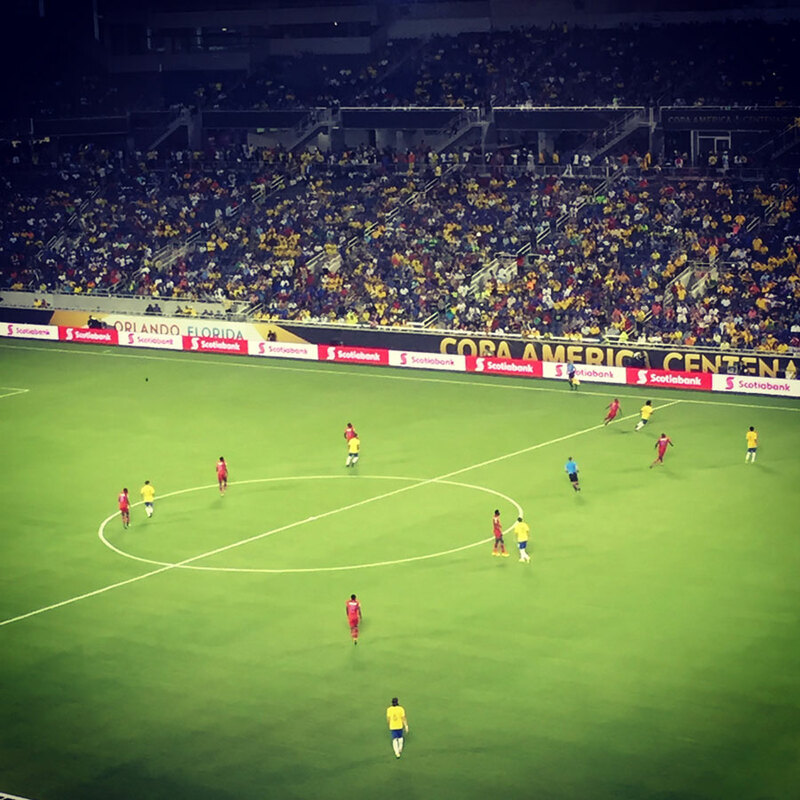 Brazil defeating Haiti by 7 goals to 1 in Orlando. Images © Austin Miller. For Brazilians, 7×1 is a scoreline that will always carry meaning. It was, of course, the scoreline of the trashing that Germany gave them in the 2014 World Cup. That match dashed the dreams of Brazil lifting the Cup on their home soil, and stained Brazilian football in a way which will never be washed clean. 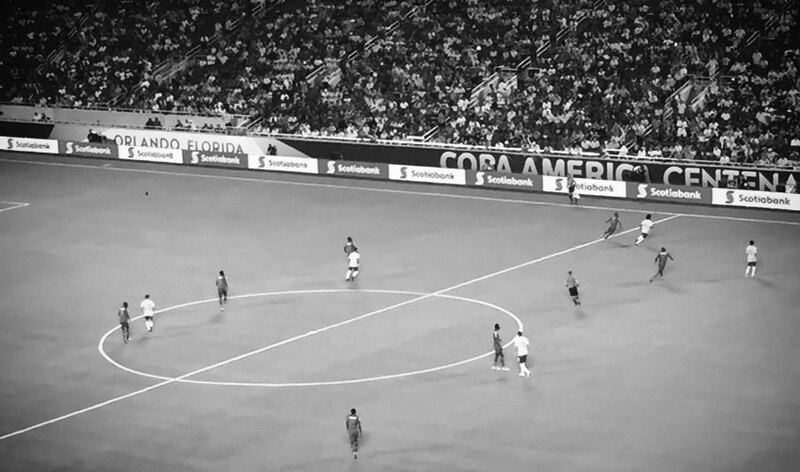 It wasn’t insignificant then, that on Wednesday night in Orlando, Brazil defeated Haiti by that same score in their second match in the Copa América Centenario. For Brazil, the goals came early and they came often. It began with Coutinho ripping one passed Haitian keeper Johnny Placide, and continued all the way through Coutinho’s hat trick clincher, a beautifully curled shot that will be in the running for goal of the tournament when all’s said and done. It was in a word, dominant. As Brazil scored their seventh goal of the evening, just before the final whistle, murmurs travelled through the press box: “Sete a um de novo!” “ Seven to one again!” they said. It wasn’t lost on those watching that this scoreline, forever linked with a seleção, had shown up again. To their credit, Brazil’s players and coaches dismissed the coincidences of Wednesday’s 7×1 and that from 2014, scoffing at postgame questions from the media. It goes without saying that Brazil winning 7×1 against Haiti in Orlando, and Germany defeating Brazil 7×1 in the World Cup qualifying are different. Only a fool would try and tell you that the two results are even close to similar in terms of importance. But Wednesday night was an impressive moment for Brazil. For the first time since the 2013 Confederations Cup, Brazil had its swagger back. They passed through and around the Haitians, throttling a team as they should have been throttled. Gone was the pragmatic Brazil that would have won 2×0. In its place? A Brazilian side showing signs of a return to the form of old. This tournament is a new era of football for Brazil. Only 2 players who were on the 23-man roster for the 2014 World Cup are on this roster: starting right back Dani Alves, and the not yet used Hulk. Other than Neymar, and the 31-year old Dani Alves, no players who played a significant role on that team are expected to play a significant role for Brazil going forward. In their place is the next generation: 19-year old Gabigol, 23-year old Coutinho are already in the fold, with the already impressive 19-year old Gabriel Jesus waiting in the wings. There are others too: Douglas Costa, who misses this tournament due to injury, and others who will make themselves known at the Rio Olympics. As each goal on Wednesday night showed, despite the deserved criticism of Dunga, this is a promising time in Brazilian football in terms of talent, make no doubt about it. There are still issues for this side, especially as far as this tournament is concerned. Elias seems incapable of making a forward pass, and Lucas Lima has yet to be utilized to his full potential. The Santos midfielder is as good of a passer as you’ll find, but hasn’t yet been truly unleashed. However, despite these issues, after this 7×1, Brazil look confident for the first time since that last fateful 7×1. And that’s the story. Because as everyone knows, there is no side more scary in all of football than a confident Brazil.